What are Ranger II Casing Spacers? 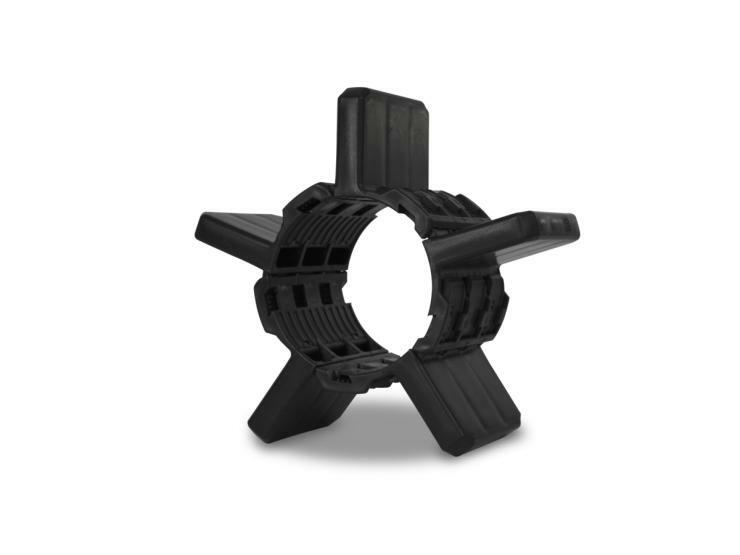 Each Ranger II Non-Metallic Casing Spacer consists of a low friction “moulded-in” runner segment manufactured from UV resistant polypropylene that is mechanically joined with a slide lock to encircle the carrier pipe. 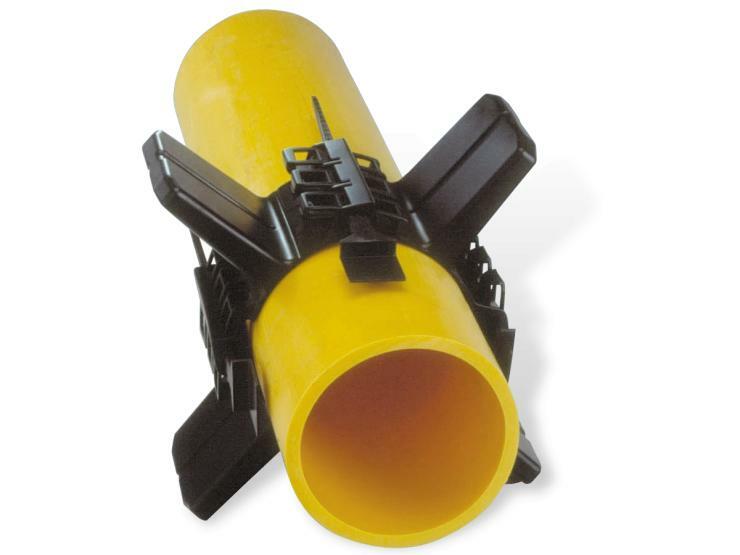 Ranger II Non-Metallic Casing Spacers are used to isolate carrier pipes within casing pipes and to ease the installation of a carrier pipe when it is dragged for long distances through a casing or penetration & are designed to last the life of the piping system. All non-metallic. No nuts, bolts, washers or any other metal parts to corrode or degrade over time. Designed for carrier pipe diameters from 21mm to 955mm in diameter. Segmented pieces – small inventory may be used to accommodate a large variety of pipe styles, types and diameters. Easy assembly. Simply slide the segments together and firmly connect with patented Slide-Lock system. Wide variety of runner heights to allow numerous options for pipe positioning within the casing. Runner variations may be used to adjust for grade. Can also be used for communications or electrical cable. Segment band and runners moulded as one piece. Wide temperature range, -30. to +100. C.
Eliminates sand or grout fill. Low coefficient of friction for ease of installation. The Ranger II Non-Metallic Casing Spacers play an important role when making long pulls/pushes with heavy pipe when used in river, canal, bridge, road & railway crossings or when dragging pipe through lengthy pipelines. The Ranger II Non-Metallic Casing Spacers are available in five different band sizes. The band size required will depend on the diameter of the carrier pipe. The casing spacers are designed for carrier pipes ranging from 21mm to 955mm in outer diameter. The runners of the casing spacers have a tensile strength of 17,600psi, a flexural strength of 25,300psi and a compression strength of 18,000psi. To support and electrically insulate a pipeline from other external (casing) pipes. When a pipeline intersects with a railroad right-of-way, highway, waterway or any other thoroughfare the pipeline usually passes under or is buried beneath the obstruction. For protection in areas where the carrier pipe is placed inside a casing pipe in an effort to “double contain” the fluid that is passing through the carrier pipe. To protect the carrier pipe from the detrimental effects of the environment and surrounding soil. To ensures that no metal to metal contact is made between the carrier pipe and casing pipe which ensures the integrity of the corrosion mitigation program. Assembly is literally a “Snap-On”! No special tools are required to assemble the spacers. Once the correct size spacer has been chosen, simply place the segments around the carrier pipe, click the segments together and securely lock them in place by using the patented slide locks™. For carrier pipe diameters ranging from 21mm to 955mm. Spacing Recommendation: Max 243.8cm between spacers, Max 61.0cm from casing pipe end, Max 61.0cm on each side of bell or mechanical joint.